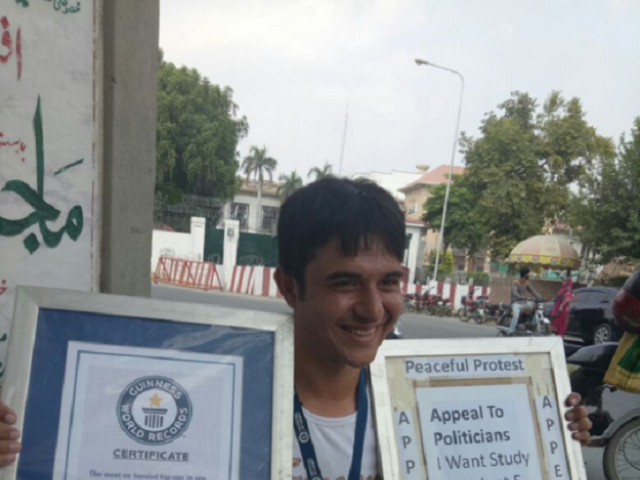 LAHORE: With a medal hanging around his neck and a certificate from Guinness World Records in one hand, the boy held an appeal in another that read: “Peaceful Protest… Appeal to politicians I want study from last 5 years but I have no fee”. 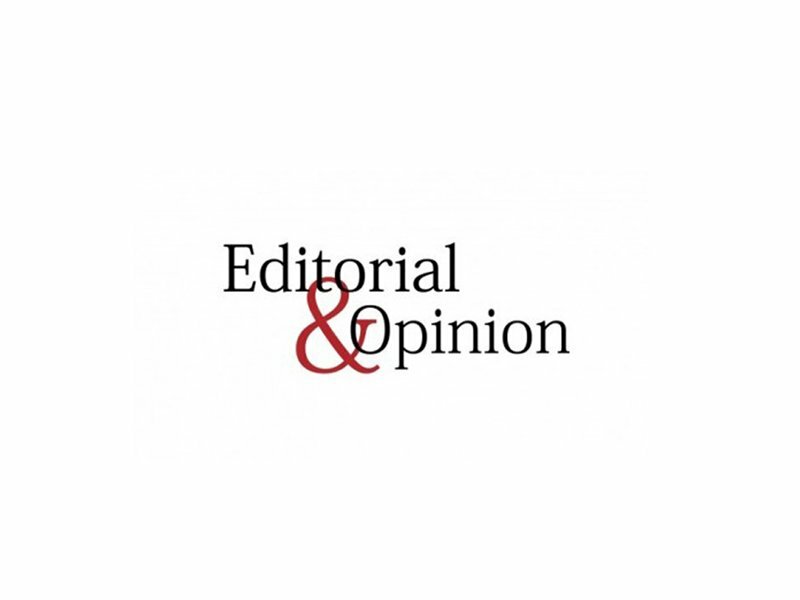 Farhan Ayub, 24, donning a white t-shirt and black trouser was sitting on a footpath in front of the Punjab Assembly, with lots of hopes that the day would come when he would become a star of the country. “I have lots of dreams to move ahead and earn a good name for the country. 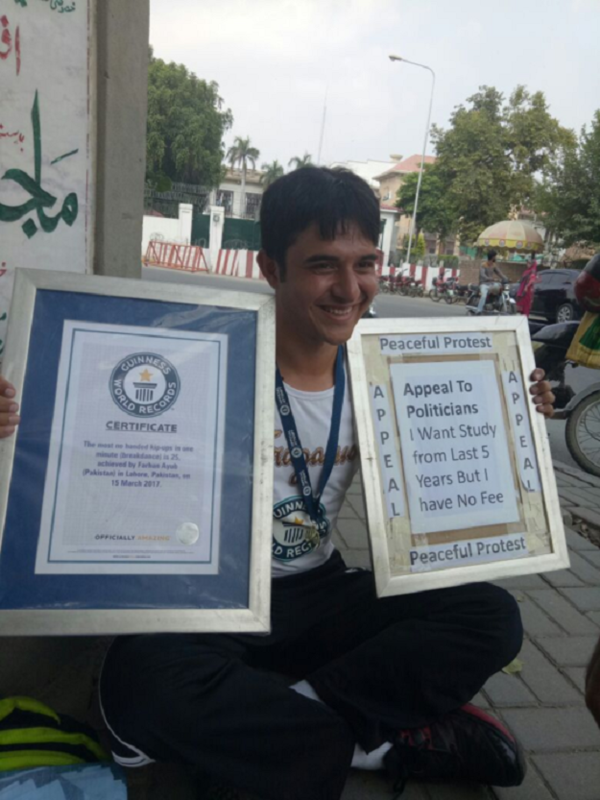 I have the honour of breaking two world records but all fell flat owing to poverty and now I am sitting here on a footpath begging for help to secure my future,” Ayub said. “Will my dream to become a star of my country come true? Will someone come to help me continue my education and sports activities,” remarked the young boy. 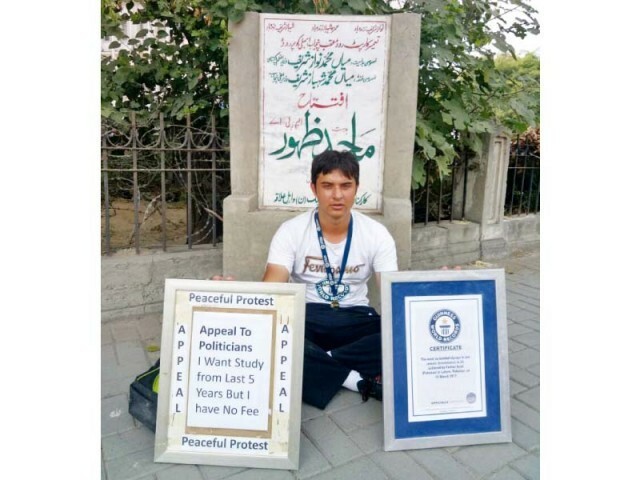 Talking to The Express Tribune, he said he had never dreamt of sitting on a footpath as he believed that he would be supported and given more opportunities at government-level for making new world records. Narrating his story, Ayub said he belonged to a poor family which could not support his education or sports activities. “I have been working at general stores. I have also worked as a janitor at several medical stores to support my family. I have an elder brother, Usman Ayub, who is working in WAPDA under son quota,” he said. Ayub broke UK player Brandon’s kip ups record. He had made 22 in one minute, by setting 34 kip ups in February 2014 Punjab Youth Festival. He said in March 2017, he also set his second record in Guinness World Records by making 25 ‘no handed kip ups’ as the representatives of Guinness World Records believed they would note down the name of a player who would successfully make more than 18 ‘no handed kip ups’. “I want to set new records and break the records already made but I have no resources. Passersby may believe that I am begging on this footpath but actually I am not. I have faith in God that He will make the way for me,” he said. Grappling with extreme poverty, Ayub said he has a strong will to move forward and all he needed was a help from someone to continue his education and sports activities. “I just don’t need money. I need someone to look after my education and sports expenses. That is all I want,” he remarked. 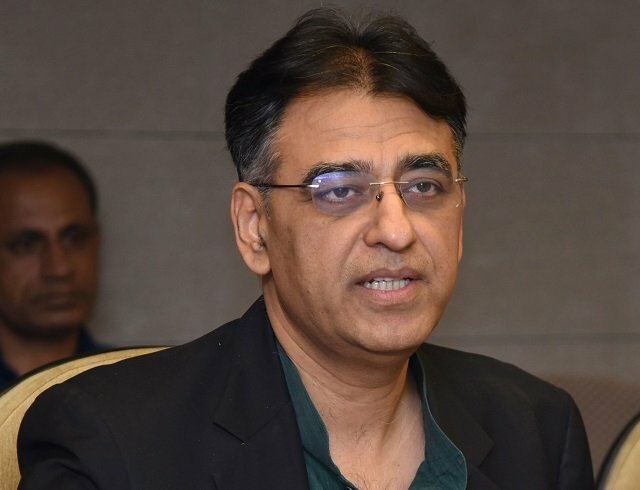 He appealed to the government, opposition parties members, Chief of Army Staff Gneral Qamar Javed Bajwa, Chief Justice Supreme Court of Pakistan Mian Saqib Nisar and well-to-do people to support him continue his education and sports activities. Published in The Express Tribune, August 23rd, 2017. This is really dumb. Why does he feel that he is entitled to get into a private university? In the video he states that he does not want to go to a Government university because they are far from his home off of Riwind road … huh? There are poor kids from various villages who work hard and study at the same time and go to universities in cities far from their hometowns. 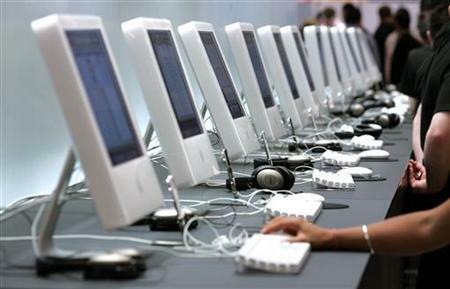 Universities give admissions to athletes who have shown outstanding performance in their sports. They do it so that student in return will bring medals and recognition to their university. This guy has a world record for break-dancing kicks!! How is that a talent that translates into anything substantial? There is a man in Pakistan who is in the Guinness book of records for holding the fastest time to make 3 Chapatis… going by this kid’s logic, that Chapati record holder should be given a free ride to Agha Khan Medical University. This kid need to pull up his sleeves, study hard, get good grades in competitive exams and try for hundreds of scholarships that are available in the country.